The Chili Sauce recipe here is so good you’ll eat it on everything! We eat it on eggs, potatoes, roast beef, ham, chicken and sandwiches. Inside a grilled cheese sandwich is a favorite way we enjoy this chili sauce. With just the right amount of ground cloves and cinnamon mixing with the rich tomato taste, who needs ketchup? Be prepared to take up the WHOLE day making it though. 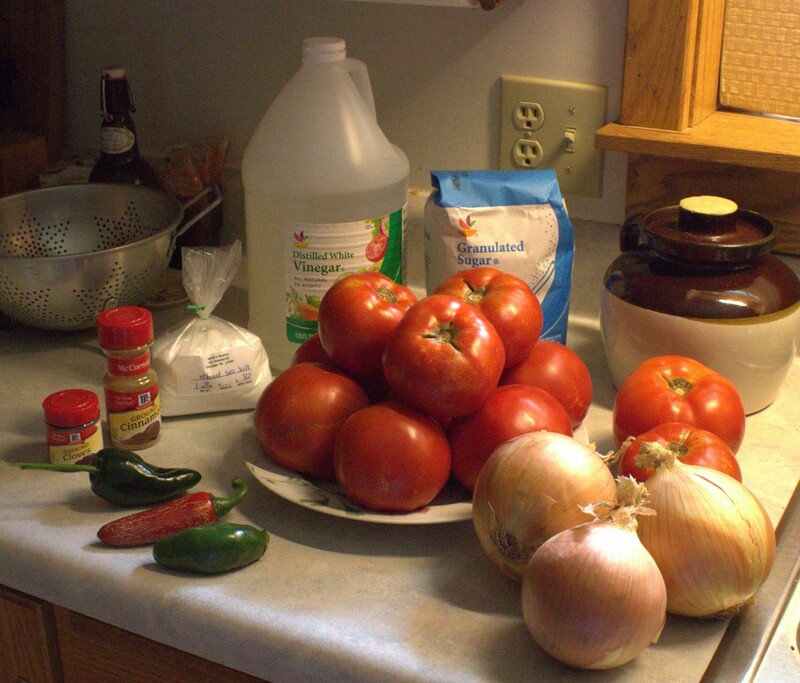 It does take several hours for so many tomatoes to cook down to a thick sauce. A crock-pot could be used to advantage here, but I don’t have one so I use a kettle on the stove instead. Chop the tomatoes in bite-size pieces. This makes the tomato skins that make it through processing a manageable size in the finished product. Put all ingredients into a large stock pot or crock-pot and bring to a boil. Of course you can make it hotter depending on how many and what type of peppers you add. At different times we’ve used jalapeños, tiburons, chili peppers, or even mild peppers with a sprinkling of cayenne pepper flakes. Once boiling, turn the heat back to a simmer, but not too low. This part is important. You want to cook out most of the water from the vegetables so the heat setting can be a little higher to start with as there is more water in the mixture at the beginning. As the mixture is cooked steam comes off so the sauce becomes less watery as you go. 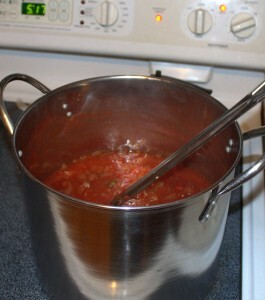 The sauce can easily scorch if the heat setting is too high, especially when it starts to thicken. What works on my stove is to bring the vegetable mixture to a boil on high heat, then turn the heat back to about 8 o’clock (if the stove dial was a clock face) or medium-low. Make sure to stir the mixture occasionally, taking note of the thickness of the sauce. When the sauce has reduced in volume by a couple of inches in the pot, turn back the heat a notch or two to prevent scorching. Keep stirring and checking the sauce consistency. When it seems THICK, it’s time to can it. 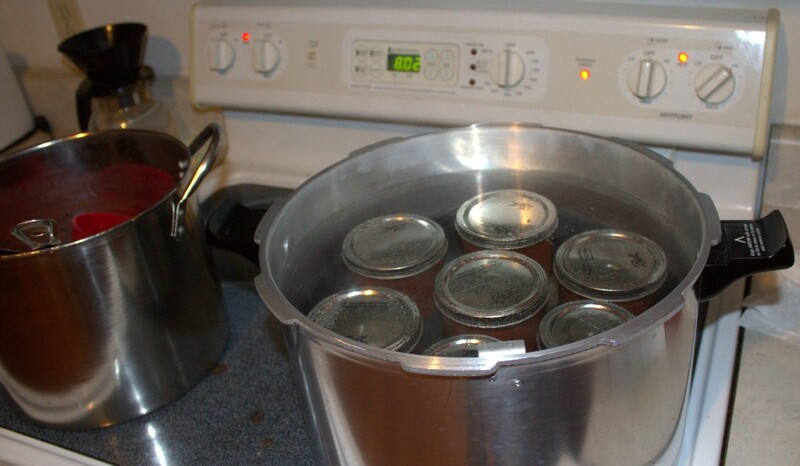 Ladle into hot jars and process in water bath for 15 minutes. 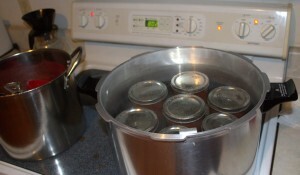 Put the lid on the water bath during this sealing process. 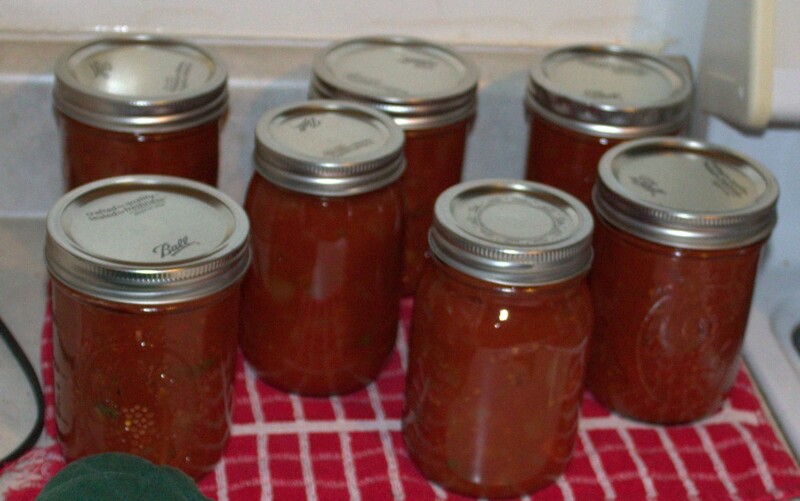 If you’re lucky enough to have lots of tomatoes at the end of the growing season, making this chili sauce is a great way to use up those extra tomatoes. Note: A friend reported that she used this recipe with green tomatoes and was very pleased with the outcome. Just saying!